Sugars, too much of a good thing? Glycation is the non-enzymatic reaction of sugars with proteins to form advanced glycation endproducts (AGEs). AGEs cross-link and inhibit proteins, and in humans, is one of the major causes for diabetes-associated complications. 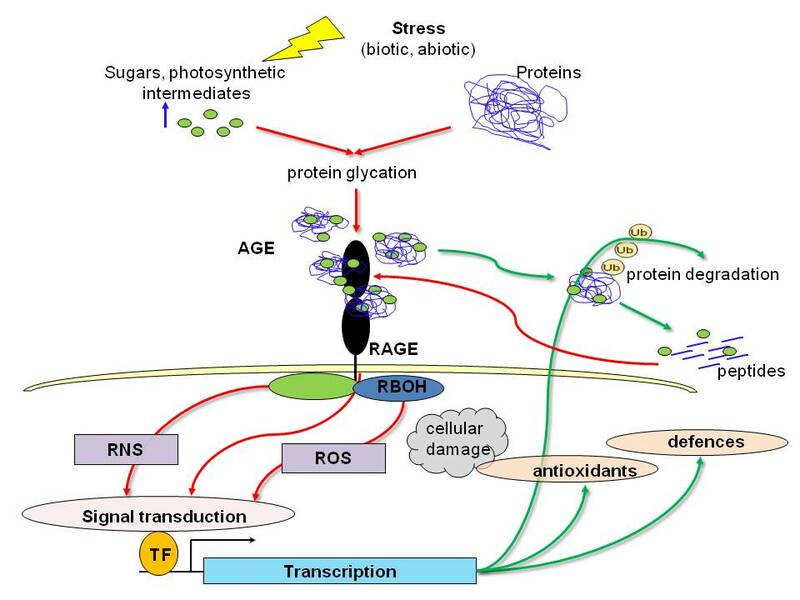 Due to their stable n.
While glycation is known to trigger defense mechanisms in animals, little is known about the role of glycation in the regulation of defense responses in plants. My lab has shown the presence of specific early and advanced glycation products in response to stress and diurnal variation in Arabidopsis leaf extracts, linking carbohydrate associated protein modifications to underlying physiological processes (Bechtold et al 2009). Additionally, the major players of glycation are present in abundance in plant cells. Methylglyoxal (MG) is produced in the cytosol and chloroplast during glycolytic and photosynthetic processes, and during stress MG levels increase up to 6-fold in various plant species, caused by changes in photosynthetic metabolism. These observations all point to the likely existence of a signaling network responsive to glycated peptides in plants.